While these loaded nachos are perfect for a busy school night--they are also great for a weekend lunch or dinner too. Usually by the weekend, I have a bunch of leftover vegetables that make perfect taco or nacho toppings. I love to serve nachos in a "build your own", buffet style layout. The girls can pick and choose from an assortment of toppings--and create their own plates all by themselves! With my own seasoned ground meat and homemade tortilla chip strips, I generally have a fairly fresh nacho bar. It is always amazing how many veggies the girls will pile onto their nachos when they choose them! Brown the ground meat in a skillet over medium heat. Drain away any drippings. Add the spices and the salsa. Cover and simmer over low heat for 8-10 minutes, stirring occasionally. 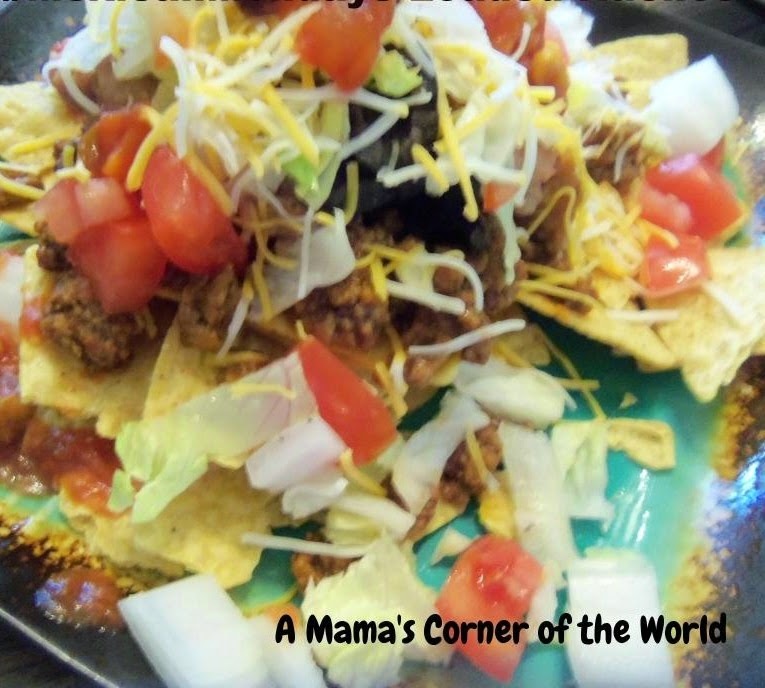 Offer a plate or bowl of tortilla chips or strips and let the nacho building begin! Choose an assortment of toppings. Make the toppings easy to use. Add tongs, forks, serving spoons, etc. to each container of toppings. Keep the toppings easy to reach for the little ones. Offer large plates or bowls for building the nachos. My girls typically build (and eat) their nachos much easier when they build them into a soup bowl. Toppings stay contained in the bowl and rarely slip over its edges! Consider using tortilla strips or scoops instead of large tortilla chips. My girls struggle with large chips in small hands! We are much more successful (and less messy) when we serve strips or scoop style chips. They also tend to slow down the meal!